The Missouri River is the longest river in North America. It flows 2,341 miles before joining the Mississippi River, but for all intents and purposes we’re concerned with the 50 mile stretch below Holter Dam. At times, this stretch is called Montana’s largest spring creek, but rather, the tail water flows mimic the prime conditions of a spring creek. Water flows at a fairly consistent temperature, compared to our local free-stone rivers and boasts good clarity year-round. Due to these conditions the fish grow at a staggering rate, and at times it seems there aren’t any small fish to be found! Due to the abundant aquatic insects the number of trout below the dam is an estimated 16,000 fish per mile! That makes for some excellent Missouri River fly fishing opportunities. 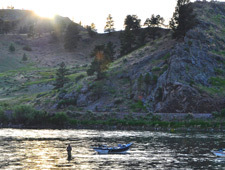 While this is a big, wide river, and possibly not as intimate as our rivers in Missoula, it is a great addition to what we are able to offer while fishing with Clear Creek Outfitters for a couple of reasons. We can head there for the day when our local rivers are blown out. 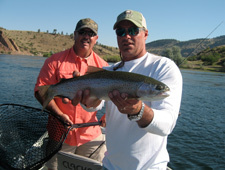 It adds to the extensive variety of fishing we are able to offer. The Missouri has all three types of trout: rainbow, cutthroat and brown. 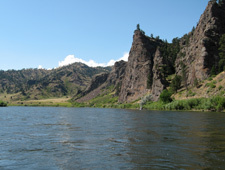 The upper-end of the river consists of a predominately rainbow trout population and the lower-end, near Cascade switches to a population comprised of predominately brown trout. The average size fish on the Missouri, is 18-inhes, while moving further downstream quantities are lower, but chance of catching larger fish (20-inch and larger), increases. 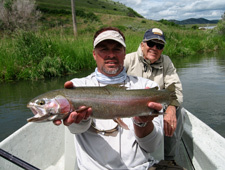 Join us and create some remarkable memories Missouri River Fly Fishing!